At the end of November the team celebrated its second victory of the season after securing sponsorship from Daimler. 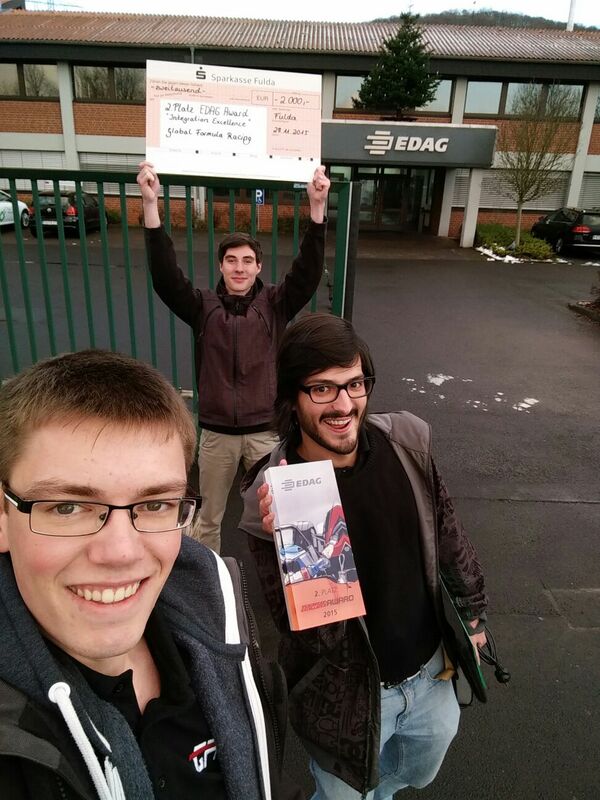 The Global Formula Racing team had the opportunity to participate as one of five finalists for the Integration Excellence Award at the headquarters of the EDAG group in Fulda. This award recognizes Formula Student Teams for demonstrating the best possible integration of new innovations or unusual solutions in a complete racecar system. Three team members (see picture) were tasked with presenting our new development, the CAN to sensor interface (CSI), and demonstrating our approach before a panel of experts. Special emphasis was placed on the project management tools which were used to confront problems during the development process and how the CSI can be further optimized in the future. Our presentation demonstrated the innovation in our conception of the CSI to the judges, and we claimed second place in the EDAG Integration Excellence Award. During the event we also relished the opportunity to connect with the other finalist teams, among which were Racetech Freiberg, KA-RaceIng Karlsruhe, Einstein Motorsport Ulm and DHBW Engineering Stuttgart. We would like to once again sincerely thank the EDAG group for this interesting event and the valuable discussions!